Night shift needed for Nissan Qashqai | What Car? Nissan's Qashqai small family car is proving so popular that the company is having to add a third shift as its production plant in Sunderland. Nissan has already had to increase production by 20% since the car's launch in March last year, and now it is seeking 800 new workers. By December, Nissan hopes to have all these workers in place, 400 of which will be permanent positions. 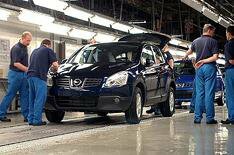 • Want to see how a Qashqai is made? Have a look at our exclusive video of the car being made by clicking here.